Lea and Gale are in the same creative writing class. They get the same pop culture references, order the same Chinese food, and hang out in the same places. Unfortunately, Lea is a little aloof, Gabe is shy, and it looks like they are never going to work things out. Fall in love with falling in love with this irresistibly romantic, completely original novel! I listened to A Little Something Different in two sessions of yard / house work. Some of this had to do with the fact that we are overhauling our backyard and did a lot of work, the rest had to do with me not being able to stop listening. My favorite thing about this novel is the narrative. Our main characters aren't the narrators, which puts the reader in the position of being their friend, Starbucks barista, or a squirrel and allows us to experience the frustration of these two not taking a step toward the relationship they both clearly want to be in. I love seeing their interactions through the eyes of all these people, because we really get to see Lea and Gabe in all areas of interaction and get a full experience. The unique perspective of being an outsider to our main characters, but at the same time seeing them in various social situations makes for a great story. One of my favorite point of views was from their creative writing teacher. She pegged them from day one as "a couple" and made it her mission to get them together. She would create assignments in hopes that they would partner up or discuss them together and get the ball rolling - she even encouraged both of them to take Creative Writing II when the semester ended. She was also constantly annoyed with Hillary, another student in the class, when she would foil her plans by pairing of with Gabe . . . or just talking in general. Sandy did an amazing job creating a love story told from outside perspectives. I never felt like I didn't get the whole story or that I was missing something by not being inside Lea's or Gabe's head, even when part of the story was being told by a squirrel or park bench. Despite being told in numerous perspectives, each character holds true to their own personalities. They're not cardboard characters created just for the purpose of a unique narrative, but players of the story in their own right. 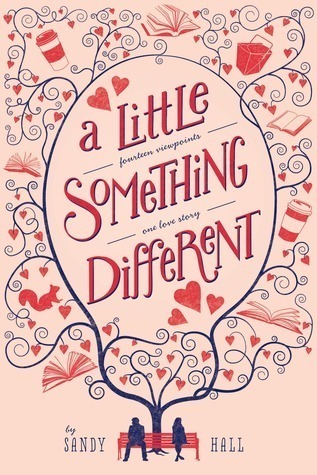 If you're looking for a fun and unique love story, that is both fun and lighthearted, you'll definitely want to pick up A Little Something Different.